The seventh chapter in the award-winning Jewel Quest series is here! The famous jewel adventurers, Rupert and Emma are back and on an adventure unlike any you have ever seen before! After receiving an urgent mysterious message from their old friend Hani: "Jewel Boards in danger. ", the duo must work together to save the Jewel Boards and get Hani to safety. But can they do both? Will they have to choose between the treasured Jewel Boards and their friend? And who is putting everyone in danger? Find out in Jewel Quest: 7 Seas! Dive into this exciting adventure by matching 3+ jewels as fast as you can. 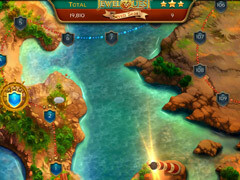 Jewel Quest: Seven Seas stays true to its roots - giving longtime Jewel Quest fans a “pure” jewel matching experience while delighting new players with jewel swapping tricks unique to this beloved series of games. Exciting new elements include new jewels to match, new tools and power-ups as well as a never-before seen Collapse-style mode! 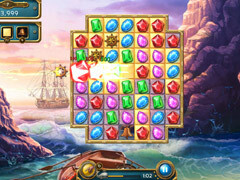 GrumpyGranny2 - "I love all the jewel quest games. I love the sounds and the intrigue of the games." speedyiwin - "Ahhh... the classic game of Jewel Quest. Love this game. One of the first and best match-3 games on iWin." munchie2009 - "I love all Jewel Quest games. If you like match three games this is your type of game!" slowpoke3 - "I like all the jewel quest games. I've stayed up for hours playing it and look forward to playing other games." sueneal - "I Am AM addicted 2 all of jewel quest,i luv them all, what can i say"
Earz3 - "I love it. very addictive and fun. Its exciting to pass a level and see what the next one has in store for you"
mystikals - "I could see me literally sitting here playing this one all day. The levels get harder as you get up there higher, but you are able to do them. Try this one for a lot of fun." bbeasley - "I loved it so much i had to take a week off work. Enjoyed the game and all the other downloadable games too, 5 stars all the way"
ppineapple - "This original series from iWin, Jewel Quest, was the start and the fame of iWin. The graphics were really simple and adventurous. The gameplay was simple, but challenging." 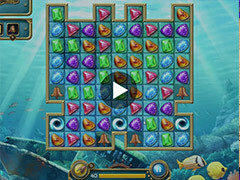 murpat41 - "Jewel quest has me hooked i love all the jewel games for any one looking for a easy but not so easy game then jewel quest is for them"
sidney321 - "Jewel Quest has to be the most beatuiful match 3 game ever created. The sounds of the game, to the wind blowing to an animal cry at the end and during of each level is marvelous, and the graphics are simply beatuiful to the jewels itself to the gorgeous realistic backrounds. The exciting story kept me going and I could play for hours without realizing it..."
prcouncilb - "I really enjoyed the game had quiet the challenge it was super fun and entertaining"
fuzzybu13 - "I love it, can't get away from it, and I've tried, its exciting and love that it changes all the time." patchqueen - "Good jewel quest action for months. Challenging grids. It will make you want more." michbrian133 - "I really liked this game. It kept me entertained for hours and hours while visiting family for a week. Lots of different styles made for enjoyable play time." © 2016 iWin, Inc. Trademarks are the property of their respective owners. All Rights Reserved. 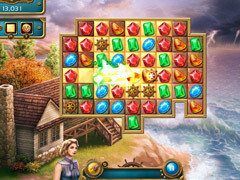 Jewel Quest for Wii U™ brings the classic Match-3 puzzle game to life in stunning HD! Solve 72 challenging puzzles through 6 fantastic, beautifully-rendered locations, each with its own unique, orchestral background music. Make matches of three (or more) of a kind to remove jewels from the board and turn the tiles behind them to gold, but don't run out of time or moves before completing the board! Endless challenges await in this brain-bending puzzler as you explore the mysterious Isles of Illusion. Uncover their secrets... and survive their dangers! While piloting his Cessna in a Himalayan snowstorm, Raj crash-lands on a frozen mountain, thus kicking off the adventure in Jewel Quest 6: The Sapphire Dragon. Raj’s crash has led him to a chance discovery of the Temple of Wishes, an ancient complex thought to be only legend! Raj’s hotshot team of archaeologists is led on a quest around the globe in pursuit of Jiang Hao and her pirate posse. On their journey, the group must use their skills to uncover secrets about the Sapphire Dragon. The hit hidden object series is back, and it's better than ever! Venture through the hidden relics of Greece as you join Emma in search of her husband and daughter, who have fallen victim to a horrible struggle. Don't miss out on this exciting and dangerous adventure that is unlike any other! Follow the travails of intrepid explorer, Percy Pack, in Jewel Quest: The Sleepless Star. On a quest for a jewel called the Sleepless Star, Pack discovers that the jewel has been stolen from a Native American village by an unscrupulous jewel collector! After answering her uncle's call, Eva Witheby winds up far from home and amidst strangers in Jewel Quest Mysteries Trail of the Midnight Heart. It's hard to know who to trust when treacherous trails and veiled secrets abound. Alongside Eva, uncover relics in eye catching hidden object screens. Unearth tools that will help you reveal shards of the precious jewel boards and discover all new scrolling search screens that put you in the front seat of whizzing planes and a whirlwind adventure. Rupert and Emma's friend, Ratu, has discovered a valuable tablet in the ruins of an ancient civilization, little does he know that this find is just the beginning. When his beloved assistant Yumi is abducted, Ratu is propelled into a treacherous game of cat-and-mouse with a gang of dangerous thugs. Travel with Ratu in this Jewel Quest Solitaire sequel, and experience compelling Solitaire layouts and addictive new Jewel Quest boards. Fresh features and power-ups, plus 100 boards of combined play, will make Jewel Quest Solitaire III feel brand new again! In Jewel Quest Mysteries, Rupert and Emma are plunged into the land of ancient intrigue, Egypt. A hidden object game shrouded in the lore of Jewel Quest and the mystique of ancient Egypt. Time is running out! It's up to you to follow the clues and find the cure! Emma and Rupert return to Africa where they are met by Aunt Roberta, a loony lady with a crazy cache of lore and a hatbox full of playing cards. She will lead our unlikely duo from marketplaces to museums in a brand new card-matching, jewel-swapping, mystery-solving adventure! New jewels, coins, and special moves on the jewel board await you in 114 all new layouts set against rich, vibrant backgrounds. The dangers of the safari, The history of the Zimbabwe ruins and the majesty of Victoria Falls await your discovery, filled with puzzles of skill and twists, while surrounded by gorgeous dynamic backdrops and animation. Get swept away by the heart pounding soundtrack as you're immersed in realistic and authentic African settings. Play Tri-peaks Solitaire in a new way using jewel-themed card decks. Match card suits to earn pieces for the jewel board then turn the board's spaces to gold. Unearth buried cards, avoid cursed jewels, and solve the 114 card layouts on a South American jungle trek. Experience 684 possible card scenarios through an exciting new Jewel Quest story. Earn the respect of your fellow archaeologists and collect oodles of treasure and jewels!